Yesterday I was down state and had the opportunity visit the cemetery at the New Hanover Lutheran Church. It is in this cemetery that Frederich Schienlin is buried. I believe this church is where Freiderich’s children were confirmed. Most, if not all of his daughters married Gilberts and in the cemetery there are a number of Gilberts buried nearby…. but no other Schoenlys. His wife, son and son’s wife were buried over in Boyertown in the cemetery of St. John’s Lutheran Church (I think). They are buried under the name of Schonly (with umlaut). About 10-12 years ago, I took a picture of Frederich’s headstone but the stome has deteriorated a bit since that time. 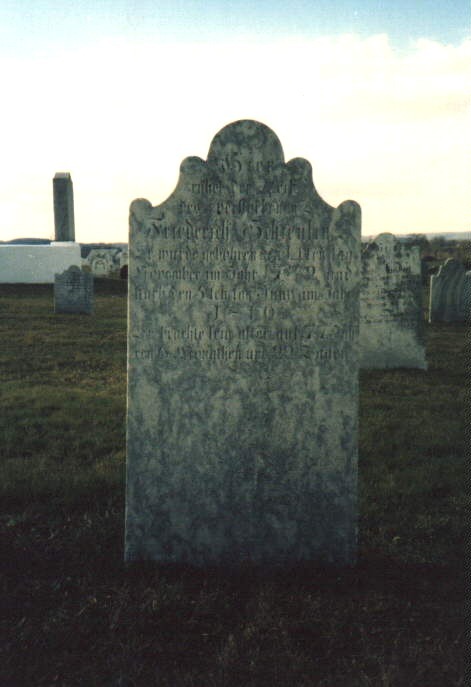 The grave is immediately behind the church, three rows behind a a marker for the Revolutionary War Soldiers who died in the church when used as a hospital during the Revolutionary War. Wish I had known you were coming down to this area. I would have loved to have gone with you cemetery walking! Actually, Fried’k’s wife, son and son’s wife were reinterred when a portion of the cemetery was taken to put an addition on the Good Shepherd church near to the St John’s church. The stones are stacked back to back in a few rows. I have taken pictures of the stones for my pictorial genealogy chart for my more immediate family line from immigrant to John and then Wilson and his children. It gets too unwieldy after that! I got a copy of a newspaper article from the church office about the reinterment. I think the reinterment was done in the 70’s. Hi Pat, I’ll have to check that out next time I get down into the area, I had not located them. I think they were actually the parents of Andreas (Sr)’s wife, Anna Maria Schwienhart. It’s been a long, long time since I looked into this but I think way back when ….. what today are two churches were a ‘Union’ church. The Lutherans & German Reformed (I think) shared the building where Good Shepherd is today. The German Reformed congregation then bought out the Lutheran congregation and they built a new building close by. The cemetery was shared by both congregations, up to that point anyway. I visited that cemetery many years ago and saw the location of the moved graves. I was impressed (negatively) with the almost shoe box size each grave was given. I guess not much is found after more than a hundred years. I suppose it is preferable to just paving the site over like some other congregations have. Actually I am under the impression that whatever remains there were (and according to a relative of mine who was a young boy and lived nearby, often went to the site to watch the work – there were remains) were all put in a common grave with a large monument over it. The stones were just lined up so they could be viewed. That is my understanding. And I would enjoy walking with you. I stated above that no other Schoenlys were/are buried in the New Hanover Lutheran Church cemetery … that is not correct. There are several members of Jacob L. Schoenly’s family buried there and possibly others. What I meant to say was no others from Friederich’s immediate family but this too is inaccurate. Anna Maria SCHONLE was born on 3 Jul 1772 and was the daughter of Friederich & Anna Elizabetha. She died as a child and is buried, I believe, under a coner of the church building itself. I maybe mistaken about being buried under the church structure but she was buried at New Hanover Lutheran Church.